In-content ad units are important units for your overall monetization strategy. In-content ad units are important units for your overall monetization strategy. Especially in the mobile space, where in-content units are the only real way to monetize that traffic, knowing that your units are healthy and performing at their peak potential is going to be essential to making the most out of every single pageview. The site health checks are our way of letting you know how your ads are doing. The Mediavine script wrapper automatically places in-content ads in your content based on our "screenview logic." A screenview is the height of the screen or browser. The logic spaces in-content ads throughout your post, taking into account the size of the device. How do in-content ads work? You have the option between two types of in-content ad logic in your Mediavine dashboard, with even more options to adjust frequency and placement for both types. Our new CBA in-content ad logic intelligently spaces your in-content ads to ensure we are always within the CBA guidelines. These state that ad content can not be more than 30% of the total page height. This means that in most instances, adopting these new standards will allow for additional in-content placements, and better performance for your in-content ad units! Our screenview in-content ad logic always complies with the strict ad policy of Google AdExchange, which serves 50-60% of our ads across Mediavine. Per Google's policy, the screenview logic will never show more than one in-content ad in one screenview. TEAL STAR: Your ads are doing awesome. Congrats on going for teal! GREEN LIGHT: You're good to go! No action is needed, your performance is ideal in comparison with the rest of Mediavine. Time to go for teal! YELLOW LIGHT: There's definitely room for improvement. RED LIGHT: You should look to follow our recommendations as soon as possible. Your earnings will thank you. How do I get to teal? Remember, more screenviews = more ads, so anything you can do to make your posts longer in pixels is paramount to in-content ad performance. Add more big, beautiful, vertical images to your posts. This is an easy way to get a lot of length, very quickly. Add more text to your posts. As well as lengthening your overall post length for your in-content ad performance, Google also loves long-form content. Break up your existing paragraphs into shorter segments. They should be no more than 2-3 sentences long. This also follows best practices for how your readers actually ingest your content as well. For more information on this, please see this help guide. Consider adding long pins, infographics, charts, or block quotes. Any elements that’ll add value to the content and increase the overall height of the post. Increase your body copy size. Increasing your text size and/or line height by just 1-2 pixels could make all the difference in adding more in-content ads. Consult your theme developer or a graphic designer for help on how to adjust this. Make sure your “focal point” of the post is at the very end. Once you figure out WHY the reader is clicking over your post, place that thing at the very end to encourage readers to scroll to the end of your content and spend as much time as possible with your in-content ads. Once you’ve made changes, test your post. Look at it on your computer and on your phone. Are you getting at least 3-4 in-content ads in both places? Bingo! you’ve just optimized this post’s performance! 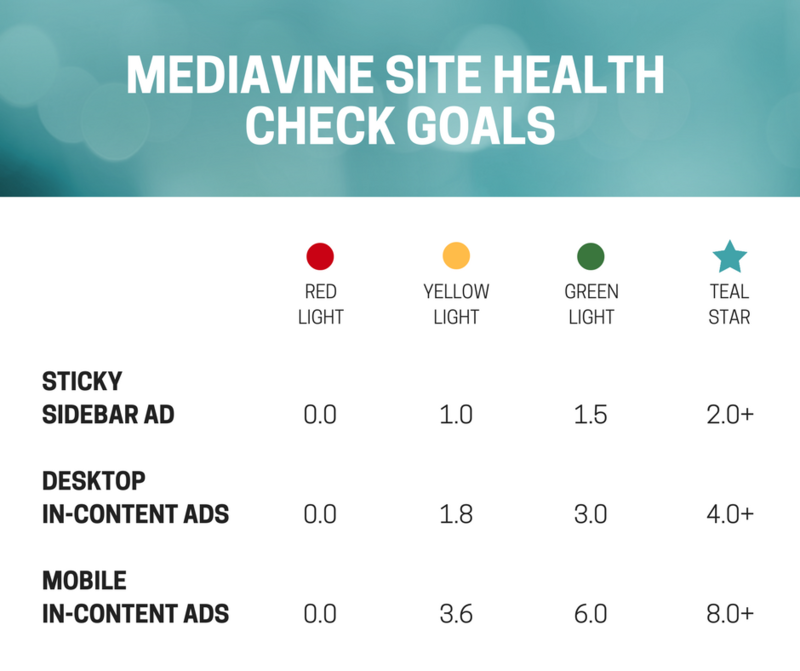 If you have any questions about this, or would like some further examples on ways to improve your site and optimize your ads, please email us at publishers@mediavine.com.